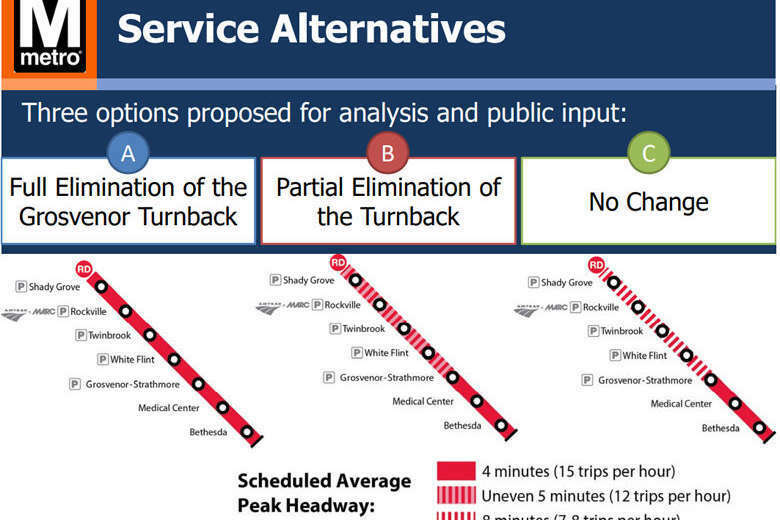 Metro staffers have expressed concerns about the financial and logistical impacts of extending rush-hour service to Shady Grove and Rockville, but the transit agency will get public input and study the issue before any changes are made. WASHINGTON – Metro could add additional rush-hour Red Line service to Shady Grove and Rockville in Maryland by the end of 2018, but several barriers and concerns remain. Making no change at all. The agency plans public comment on the proposals in April or May, with the feedback and a federally required civil rights analysis to be presented to the Metro Board this summer. If any changes are made, they could begin in late December. Metro still plans to hire an outside consultant to study any maintenance or operational fixes that may be needed to run the trains efficiently. Elevator, escalator and platform improvements to handle more riders. Metro staffers have expressed concerns about the financial and logistical impacts of any change. Extending service on about half the trains would cost Maryland about $500,000 more per year and require 16 more rail cars in service each day, Metro said last month. It would leave less room for error in the event of any issues before delays build up. Metro staffers are unsure about how many more riders would use the system if there are additional trains at Shady Grove, which could make the extension a cost with little benefit. While Montgomery County has made ending the “Grosvenor turnbacks” a high priority, other parts of the region have had to put off their own priorities for Metro service over the last few years, including maintaining late-night and weekend hours. The Metro Board voted in 2015 to end the turnbacks by July 2018, but has not taken significant steps until now to consider the change. There are no plans to extend trains on the other end of the Red Line to Glenmont. They currently turn back at Silver Spring. Before service cuts last summer to reduce scheduled rush hour service to every 8 minutes at Shady Grove and every 4 minutes at Grosvenor-Strathmore, Metro said many delays could be tied to several things: a lack of automatic train operation since the deadly 2009 Fort Totten crash; track work needs; or other issues. From June 2010 to June 2017, trains were again scheduled 6 minutes or 3 minutes apart. A presentation prepared for a Metro Board committee this week blamed the delays on those issues. The agency said performance has improved since June, when schedules were cut back to provide about 15 trains per hour at the busiest times south of Grosvenor-Strathmore and about 7.5 trains per hour to and from Shady Grove. From 2004 to 2010, Metro tried to run trains every 5 minutes at Shady Grove and every 2.5 minutes south of Grosvenor-Strathmore. It regularly failed to meet that goal. From 1984 to 2004, Red Line trains were scheduled every 6 minutes at rush-hour to and from Shady Grove and every 3 minutes from Grosvernor-Strathmore downtown.